Notes: I’ve got some pretty good beers left over from the IPA challenge a few weeks back that I need to drink before the hops fade. 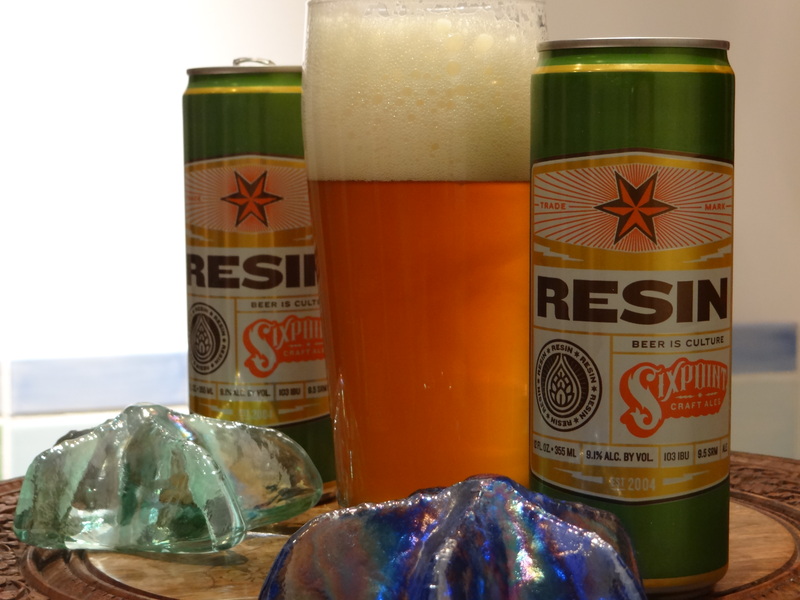 Tonight I’m having a go at Resin by Sixpoint Craft Ales in Brooklyn, which is my friend Kim’s (near) favorite beer. Sixpoint makes some pretty good beers that standout to me because they all come in tall skinny cool looking 12 oz cans. The freshness label on the bottom of the can (see the Freshness labels on beer post in the Beer 101 section) says best before Feb 24, 2014, so we should be good with the freshness of this one. Resin is a double IPA which typically means it has higher ABV and more aggressive hop flavors than a “normal” American IPA. True to that definition Resin has 9.1% ABV and 103 IBUs (international bitterness units). IBU is a term meant to capture the bitterness of a beer and is related to the concentration of alpha acids from the hops. An English IPA should be between 40-60 IBU and an American IPA can go up to 70 or 75. It is generally thought that once the IBU scale goes over 100 it is no longer possible to perceive the extra bitterness. In other words Resin is off scale. For comparison Ruination IPA by Stone is 100 IBU and Palate Wrecker by Green Flash is 149 IBU. There is a quotation on the can that I quote here “Whatever flames upon the night Man’s own resinous heart has fed. Resin is the sticky quintessence of hops that quells the encroaching malt sweetness.” It reminds me of some quote from a Rudyard Kipling book, but as you will see the last sentence accurately captures the essence of this beer. The beer pours a hazy, dull golden orange color with 3 fingers of billowing white head. The head settles out slowly leaving behind extensive lacing and dense island floating on top of the beer for quite some time. The smell is piney with a lot of fresh hop oil aroma. At this point I should say that Resin is dry hopped, which if you go back to the review on Founder’s Harvest Ale means that dried hops are added to the beer while it is fermenting. That would explain the fresh hop oil aroma that this beer gives off. I will say that the Founder’s Harvest Ale was definitely more floral and grassy, but there is no question that Resin is an aromatic beer. As expected piney oils are prominent in the taste with assertive bitterness that lingers on the tongue for quite a while after the drink is finished. I get a bit of orange in mid taste, but for the most part citrus fruits are overshadowed by the pine oils and fresh hop aroma. As is common with double IPAs a fairly sweet malt base is needed to support the massive hop character of the beer. I sometimes find the malt base in a double IPA to be a little too sweet, but as promised by the label the hop bitterness in Resin keeps the malts in check all the way to the end of the glass. I also have to say that the alcohol is well hidden and this is a pretty easy to drink beer for 9% abv (unless you don’t like bitter beers). Overall this is a very good example of the double IPA style. Fresh hop aroma on the nose, pine oil on the tongue with an assertive, lingering bitterness. The hops keep the sweetness of the malt in check and the alcohol is well hidden. This is an easy to drink beer which given the 9.1% ABV could get you in trouble.